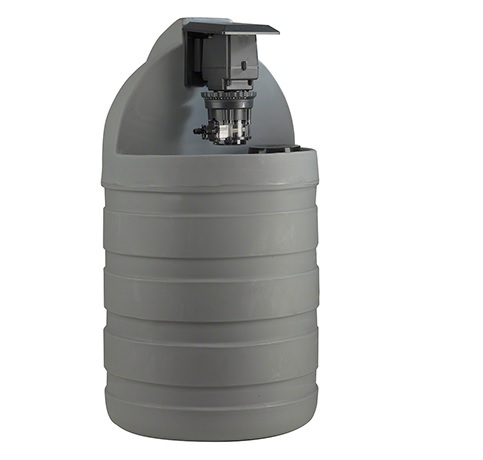 Tank systems are shipped pre-assembled for quick installation with the Classic 45 Series Adjustable Pump, mounted vertically with a rain roof. The Classic 45 Series Adjustable Pumps are single head self-priming pumps that have Adjustable outputs. The gear driven motor is 26 RPM. The Peristaltic pump advantage includes: automatic degassing, self-priming against pressure, and can prime up to 25 feet. An accessory kit is shipped with each pump and includes additional pump tube, suction tubing, weighted strainer, and mounting bracket. 3-point roller design assists in anti-siphon protection. Easy to change pump tube; lubrication is not required. Pump tubes and pump heads interchange between models. The tank is polyethylene and certified to NSF/ANSI 61. Lid has child resistant lock.